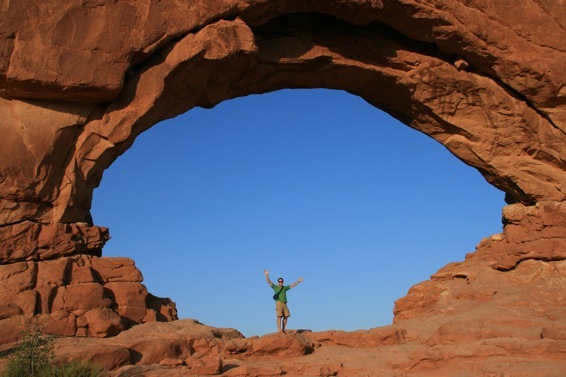 Moab is home of extreme living – high heat, and high adrenaline. Everyone sports the rugged outdoor look, at least one tattoo and a few extreme-sport scars. Pickups rule – this example below isn’t even the biggest of them! Microbreweries serve beer at $2.75 a pint. 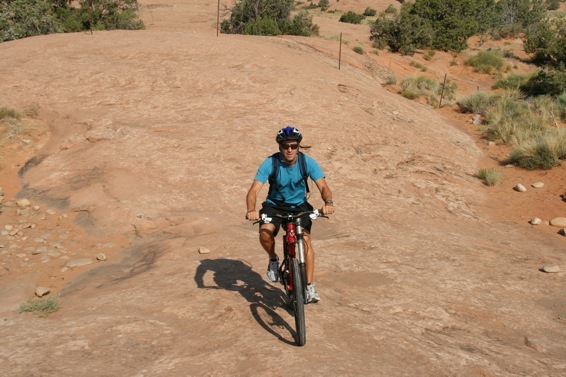 Moab is home of Slickrock, the mountainside of Navajo sandstone made famous by extreme mountainbikers. Not for the fainthearted. So you can imagine how surprised the bike rental guys were when Cathal arrived back from the route two hours before scheduled! 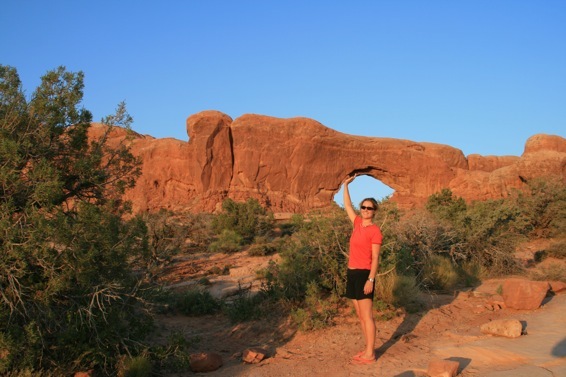 We took in Arches National Park while here – a quick sunset visit. We also decided to spend an extra night here, before heading on a long drive north to Jackson, Wyoming. After a few nights in a very hot tent (90F) or so, it was time to splash out on the Adventure Motel, complete with AC and a proper bed. I was happy to bundle up the thermarest for a night. Achieving this rest day took a bit of work on my part. I asked Cathal the other day does he not ever get tired….to which he, the ever enthousiastic traveller, replied: “I was tired for 3 years, I’m finished being tired!” Some of Cathal’s family empathise with me! Finally, it’s obvious the recession has kicked in at home – we’ve had lots of well wishes, people seem to have plenty of time to read our blog these days! Recession or not, I have to read your blog at least once a week. It keeps me going…..and makes me a little tired just reading what you are up to…..enjoy and keep blogging. thank god he’s tired of singin’! !